Plant samples in CIATgene bank, Colombia. Credit, N. Palmer, CIAT. All cells except sperm and egg cells of a plant contain the full complement of genes, therefore it is often possible to grow individual cells and pieces of tissue into full healthy plants. This process is called tissue culture or micro propagation when whole plants are grown under artificial controlled conditions (in vitro) from sections of plant tissue. The plants that result are clones of the original. Under tissue culture, a single original shoot tip is heat-treated to destroy diseases and then used through as many as ten cycles of regeneration to produce up to 1,500 daughter plants. Tissue culture is used to create large amounts of plants or growing material in a sterile environment with the required water and nutrients to suit the plant species and a gelling agent such as agar. During the process, plant hormones that regulate growth can also be added to increase multiplication or to enable the development of roots. Because the tissues are isolated and raised in contained and sterile environments, tissue culture is a highly effectively method for producing pest- and disease-free planting material. Scientist with tissue culture bananas. Credit, JKUAT. Although most commonly used for high value horticultural crops, today tissue culture propagation has also been very successful in producing improved subsistence crops widely used in developing countries. One major breakthrough made possible by tissue culture is the development of disease-free bananas in East Africa. Bananas are a major source of consumption, nutrition and income in Africa; Ugandans for example eat on average 1kg per person per day. Other notable examples include higher-yielding varieties of rice and a frog-skin disease resistant cassava variety. 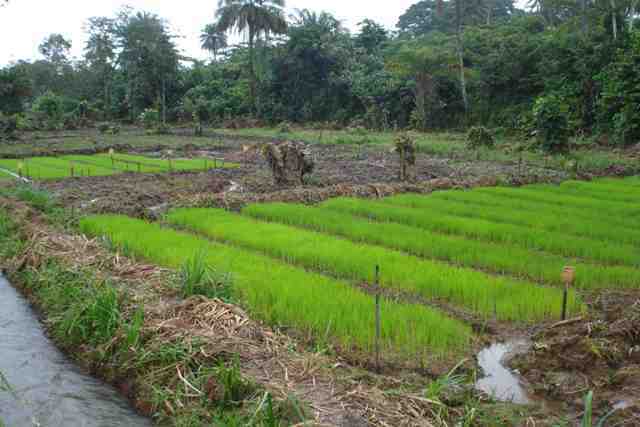 Demand for rice in West Africa is rising rapidly, failing to be met by local production. The region imports around 6 million tonnes of rice each year (half of the region’s requirements) at the considerable cost of US$1 billion. In order to address this shortfall, Monty Jones, a Sierra Leone scientist working at the Africa Rice Centre (previously WARDA), began a programme utilising tissue culture technologies to develop crosses between the African species of rice (Oryza glaberrima) and the Asian species (Oryza sativa). The former is better adapted to local environments, but typically returns low yields of around 1 ton per hectare whereas the latter yields around 5 tons per hectare. Crossing the 2 species created numerous embryos but these could only be grown to maturity with the use of tissue culture. The resulting ‘new rices for Africa,’ or NERICAs are tolerant to a variety of harsh conditions and produce much higher yields. A healthy cassava root. Credit, N. Palmer, CIAT. Cassava is a major staple crop for millions of people in East and Central Africa, mostly in the rural areas and it is the second most important staple crop in Africa after maize. Although dependable with respect to high temperatures and water-scarce growing environments, cassava is highly susceptible to a number of pests and diseases, especially African cassava mosaic disease which can lead up to 100% yield losses. Frog-skin disease, which affects cassava in South American countries such as Columbia, has been eliminated from 5 different cassava cultivars using a combination of heat treatment and tissue culture. Developing disease-free cassava varieties through the use of tissue culture in Africa may be possible as innovations seek to reduce the cost of application of the technology. Tissue culture has been shown to improve food and nutrition security, increase incomes and enhance biodiversity. In particular, the technology is useful for reducing plant breeding times or creating large amounts of plant material for research or distribution to farmers especially for crops important to food security in developing countries. 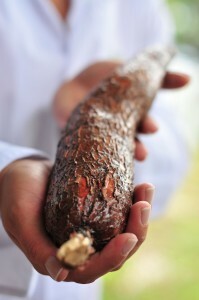 Most notably, the technique has been applied to breed disease-free, high-yielding planting material for staple crops such as bananas, rice and cassava. 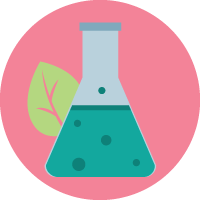 As a prerequisite for conserving germplasm in vitro (the process of taking place outside of a living organism), tissue culture enables the preservation of a wide variety of genetic resources for plants, animals and trees. Whilst widely used, the technology is costly which explains the low adoption rates in developing country breeding programmes. Tissue culture has been used to develop more than 1,000 plant species, many of which are used commercially. The main advantage that tissue culture technology offers is the ability to produce a significant number of high quality and uniform planting material rapidly that can be multiplied year-round under sterile conditions anywhere irrespective of the season or weather. During multiplication, thousands and even millions of seedlings can be produced in a very short time for transfer to the field. These methods are useful in particular for root and tuber crops such as cassava, potato, and sweet potato as well as for fruit tree crops such as banana and oil palm mainly because healthy planting materials can be produced at reasonable cost. For tree crops, especially, tissue culture has sped up the breeding process considerably compared to the length of time normally required for developing perennial planting material, resulting in comparatively cheap and fast method for multiplying the best genetic stock. Tissue culture may offer a cost-effective way to multiply a significant quantity of planting materials very rapidly, but the technology is nevertheless capital, labour and energy intensive. First, in developing countries, the resources of trained personnel and equipment are often not readily available. The availability of utilities such as electricity and clean water can be erratic and costly which can be problematic for tissue culture plant multiplication. The energy requirements for tissue culture technology depend on day temperature, day-length and relative humidity, but importantly they must all be controlled which can prove challenging if energy supplies are not consistently reliable and affordable. Without quality control, unintended variations and deformities may occur. Low cost options for multiplication through tissue culture in developing countries must be explored. Tissue culture has been widely used for more than 50 years and is now used to improve many crops important to developing country food security including major staples such as rice, potato and banana. 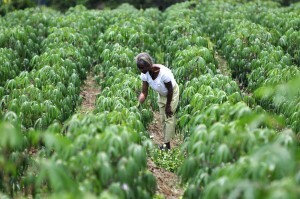 Other crops important to developing countries that are improved and propagated by tissue culture include cassava, sweet potato, and yam; commercial plantation crops such as cocoa, coffee, oil palm, sugarcane and tea; horticultural crops, such as artichoke, cardamom, garlic, ginger, and vanilla; and fruit trees, such as almond, cactus, citrus, coconut, date palm, grape, lemon, mango, olive, pistachio, pineapple, and plantain. Some of the many countries with well-developed tissue culture programmes in Africa include Gabon, Kenya, Nigeria, and Uganda. Some of the greatest successes with tissue culture has been demonstrated with vegetatively propagated (asexually) root crops. For example, disease-free sweet potatoes have been adopted on 500,000 hectares in Shandong Province in China, increasing yields between 30%–40% and incomes for 7 million sweet potato producers by 3.6%–1.6%. In India, potato breeders used tissue culture to detect viruses at the initial stages of seed production leading to an estimated 2-3 fold increase in seed health whilst generating more than US$4 million in revenues. Farmers in Vietnam participated in the use of tissue culture for high-yielding, late-blight resistant potatoes enabling them to double their yields from 10 to 20 tonnes per hectare. Zimbabwean farmers similarly improved household food security and generated cash surpluses from growing sweet potato plantings that were produced through tissue culture. In addition to rapidly breeding superior quality plantings for a multitude of crops, tissue culture is also important for germplasm preservation, the conservation of a variety of genetic resources, many of which are important for developing countries. Depending upon the crop species and method of preservation, tissue culture can aid in the preservation of genetic resources from 1 to 15 years. Cryopreservation – the preservation of germplasm in a dormant state at ultra-low temperatures, usually in liquid nitrogen (-196 °C) – is a type of tissue culture which can be used to preserve seeds, sperm, and embryos from crop, livestock, forest or fish populations. For tree crops such as bananas that do not produce seed, or crops whose seeds do not survive under cold storage such as mango, coffee, oak and many tropical tree species, cryopreservation can offer a viable alternative. Food and Agricultural Organisation of the United Nations (FAO) 2003, The State of Food Insecurity in the World 2003: monitoring progress towards the World Food Summit and Millennium Development Goals, FAO, Rome. Acquaah, G 2007, Principles of Plant Genetics and Breeding, Blackwell Publishing, Malden, Oxford and Victoria. Ogero, KO, Mburugu, GN, Mwangi, M, Ombori, O & Ngugi, M 2012, ‘In vitro Micropropagation of Cassava Through Low Cost Tissue Culture’ Asian Journal of Agricultural Sciences, vol. 4, no. 3, pp. 205-209. Withers, LA & Alderson, P (eds.) 1986, Plant Tissue Culture and Its Agricultural Applications: Proceedings of Previous Easter Schools in Agricultural Science, Butterworths, London. Food and Agriculture Organisation of the United Nations (FAO) 2003, Trade Reforms and Food Security: Conceptualizing the Linkages, FAO, Rome. Pillay, M & Tenkouano, A (eds.) 2011, Banana Breeding: Progress and Challenges, CRC Press, Boca Raton, London & New York. International Atomic Energy Agency (IAEA) 2004, ‘Low cost options for tissue culture technology in developing countries’ Proceedings of a Technical Meeting organized by the Joint FAO/IAEA Division of Nuclear Techniques in Food and Agriculture and held in Vienna, 26–30 August 2002, IAEA, Vienna. Food and Agriculture Organisation of the United Nations (FAO) 2011, ‘Biotechnologies for Agricultural Development’ Proceedings of the FAO International Technical Conference on “Agricultural Biotechnologies in Developing Countries: Options and Opportunities in Crops, Forestry, Livestock, Fisheries and Agro-industry to Face the Challenges of Food Insecurity and Climate Change (ABCD-10), FAO, Rome. Fuglie, KO, Zhang, L, Salazar, LF & Walker, T 1999, Economic impact of virus-free sweet potato seed in Shandong Province, China. International Potato Center, Lima. Uyen, NV, Ho, TV, Tung, PX, Vander Zaag, P & Walker, TS 1996, ‘Economic impact of the rapid multiplication of high-yielding, late-blight-resistant varieties in Dalat, Vietnam’ in: eds. TS Walker & CC Crissman, Case studies of the economic impact of CIP-related technologies, International Potato Center, Lima. Mutandwa, E 2008, ‘Performance of tissue-cultured sweet potatoes among smallholder farmers in Zimbabwe’ Journal of Agrobiotechnology Management and Economics, vol. 11, no. 1 pp. 48-57. Demand for rice in West Africa is rising rapidly, failing to be met by local production. More than 6 million tonnes of rice are imported each year, accounting for half of the region’s requirements. Nigeria’s rice import bill alone exceeds US$2billion. Population growth, rising incomes and changing consumer preferences will only encourage greater demand. In order to address this production shortfall, Monty Jones, a Sierra Leone scientist working at the Africa Rice Centre (AfricaRice) began a programme utilising ‎tissue culture technologies, to develop crosses between the African species of rice (Oryza glaberrima) and the Asian species (Oryza sativa). The former is more adapted to local environments but typically returns low yields of around 1 tonne per hectare while the latter produces yields of around 5 tonnes per hectare. Crossing the 2 species created numerous embryos but these could only be grown to maturity after tissue culture. 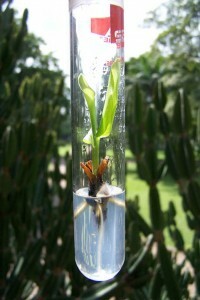 At first the tissue culture technique did not work well, but collaboration with Chinese scientists provided a new tissue culture method, involving the use of coconut oil, which proved highly successful. The resulting rice varieties, known as the New Rices for Africa (NERICAs), grow well in drought-prone, upland conditions, are resistant to local pests and disease, tolerant of poor nutrient conditions and mineral toxicity and show early vigorous growth crowding out weeds; all of which are characteristics of the African species of rice. Later in their development, characteristics of the Asian rice species appear: they produce more erect leaves and full panicles of grain and are ready to harvest after 90 to 100 days, 30 to 50 days earlier than current varieties. Due to significantly higher yields than current varieties (up to 4 tonnes per hectare under low input conditions) Uganda was able to reduce its rice imports by half from 2002 to 2007. A shift from maize to NERICA production in Uganda with proper crop rotation was found to increase income by $250 per hectare. According to AfricaRice, 60 lowland and 18 upland NERICA varieties have been named and characterized through a process of participatory varietal selection. As of 2009, an estimated 700,000 hectares across sub-Saharan African were planted with NERICA varieties, covering about 5% of the region’s upland rice growing areas. Uptake is likely to expand as more varieties are released. Many NERICA varieties are particularly suitable for use in the rain-fed upland areas where smallholders lack the means to irrigate or to apply chemical fertilizers or pesticides. In Benin, farmers that adopted NERICA varieties experienced yield gains of about 1 ton per hectare. Women also benefited considerably, generating a net income gain of $337 per hectare, becoming a key determinant in poverty reduction. In Uganda, farmers averaged 2.2 tonnes per hectare, twice the average rice yield for sub-Saharan Africa. Adopters in Nigeria also witnessed significant gains: household gross income from NERICAs increased by US$555, raising the probability of escaping poverty. In addition to benefiting rural economies, NERICAs have the potential to assist cash-strapped national economies by reducing the cost of food imports. It has been estimated that the introduction of NERICAs in Guinea alone led to import savings of US$13 million in 2003. United States Department of Agriculture (USDA) Foreign Agricultural Service (FAS) (no date), Protection, Supply and Distribution (PSD) Online database, Query: Rice Imports, ECOWAS countries, 2008 – 2014, Available from: <http://apps.fas.usda.gov/psdonline/psdQuery.aspx> [2 July 2015]. Africa Progress Panel 2014, Grain, Fish, Money: Financing Africa’s Green and Blue Revolutions, Africa Progress Report 2014, Africa Progress Panel, Geneva. (Kijima, Y, Otsuka, K & Ssenkuuma, D 2007, ‘Assessing the impact of NERICA on income and poverty in Central and Western Uganda’ Agricultural Economics, vol. 38, no. 3, pp. 327-337. AfricaRice (no date), Lowland Nerica: Breakthrough, Available from: <http://www.africarice.org/warda/lowlandnerica.asp> [7 July 2015]. AfricaRice (no date), Upland Nerica: Breakthrough, Available from: <http://www.africarice.org/warda/uplandnerica.asp> [7 July 2015]. Diagne, A, Midingoyi, SKG, Wopereis, M & Akintayo, I 2011, ‘Increasing Rice Productivity and Strengthening Food Security through New Rice for Africa (NERICA)’ In: eds. P Chuhan-Pole & M Angwafo, Yes Africa Can, The World Bank, Washington, DC. Somado, E, Guei, R & Keya, S, eds. 2008, NERICA, the New Rice for Afica, a Compendium, Africa Rice Centre (WARDA), Benin. Harsch, E 2004, ‘Farmers embrace African ‘miracle’ rice: High-yielding ‘Nerica’ varieties to combat hunger and rural poverty’ Africa Recovery, vol. 17, no. 4, pp. 10–22. Cassava is a dependable food crop for resource poor farmers in Colombia as it can in grow in harsh conditions – low soil fertility, limited water availability and with minimal inputs. A significant threat to cassava production, is the virus-like frog skin disease (FSD) that stunts root growth. In most infected plants, the symptoms are unobservable, and due to stems that sometimes become slightly enlarged, these stems are often selected for future plantings. To control the disease, the International Center for Tropical Agriculture (CIAT) developed a ‎tissue culture method to reproduce cassava through stem cuttings to create large amounts of quality, disease-free planting material. CIAT’s method was later configured to suit rural conditions. For example, for culture medium reagents, locally available fertilisers, fruits juices, table sugar and cassava starch were used whilst low-cost tools such as insulin syringes were used as micropipettes. An informal farmer’s seeds production system was also established to distribute the disease free planting material to farmers in Colombia’s Cauca Department, a low-cost tissue culture laboratory located in a rural area and run by trained farmers and their communities. The project was a large collaboration, with each actor performing a specific role. The Women Farmers Group from Santa Ana community (ASOPROSA) served as the cassava experts; an NGO (Fundación para la Investigación y Desarrollo Agrícola, FIDAR) supported social work and personnel relationships; CIAT provided experts in tissue culture, participatory research methodologies and the management of an in vitro gene bank; and the Cassava Biotechnology Network (CBN), and Participatory Research and Gender Analysis (PRGA) Programmes provided financial support. To begin the process of developing a laboratory that could be owned and run by farmers, a farmer from the region was selected and trained, followed by farmer-to-farmer trainings. The project reports many technical obstacles as well as challenges in communication between farmers and technicians. However, projects to establish and run farmer laboratories for the purpose of creating healthy cassava planting material through tissue culture has now been scaled up across 5 Colombian departments involving 119 farmers. Loebenstein, G & Thottappilly, G 2003, Virus and Virus-like Diseases of Major Crops in Developing Countries, Springer Science & Business Media, Dordrecht. Ruane, J, Dargie, JD, Mba, C, Boettcher, P, Makkar, HPS, Bartley, DM & Sonnino, A 2013, Biotechnologies at Work for Smallholders: Case Studies from Developing Countries in Crops, Livestock and Fish, Food and Agriculture Organization of the United Nations (FAO), Rome. Bananas are a major source of food and income throughout the tropics and especially in East Africa. Banana plants are susceptible to disease because new plants are grown directly from suckers from a “mother plant,” thus transferring any disease present, even if it is not visible. The black Sigatoka fungus, a leaf spot disease, has been particularly devastating to banana crops worldwide since its first outbreak in Fiji in 1963. It arrived in East Africa in the 1970s, decreasing productivity by as much as 40%. The fungus can be controlled with fungicides, but it has developed increasing resistance over the years, making the option both expensive and damaging to the environment. 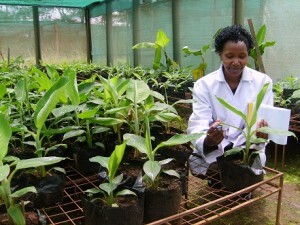 After a visit to the work on ‎tissue culture bananas in South Africa, Kenyan agricultural scientist Florence Wambugu applied the same technique in Kenya and found she could quickly generate healthy new plants. She persuaded the Kenyan Agricultural Research Institute (KARI) to undertake field trials on local varieties in the mid-1990s, and a training programme was initiated. During the last decade, more than 6 million tissue cultured banana stems have been planted in Kenya, producing additional income of around Ksh5.5 billion (US$64 million) to banana farmers. A business model known as Wangigi, piloted by Africa Harvest, has greatly increased access to tissue culture banana outlets for 3,500 farmers, with some farmers trained to teach others on how to use the technology. A farmer-owned marketing company, Tee Cee Banana Enterprises Limited (TBEL), has been established to handle everything from postharvest storage to setting industry standards.